Definition - What does Toe Stand mean? Toe stand is a challenging yoga posture that requires balance, stability and flexibility in the hips and lower body. This is an unconventional posture in yoga that is mainly known for its inclusion in the Bikram yoga sequence. It can be a difficult posture for beginners because of the balance and flexibility in the hips required. 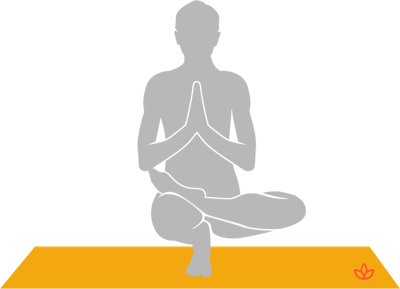 In this posture, the whole weight of the body is supported on the ball of one foot, with the other foot across the thigh of the supporting leg in a half lotus position, and the body lowered down into a squat position. The hands are in prayer position at the chest. Toe stand may also be referred to by its Sanskrit name, padangustasana. It may be necessary to practice other standing balances and hip-opening postures before this pose. Standing half lotus is often considered a preliminary pose to toe stand. If half lotus pose is not accessible, a modification can be practiced with the knees together balancing on both feet, initially. It is recommended that the full posture be held for five breaths to start with, and then work up to holding it for longer periods of time as appropriate. To add an additional challenge, the transitions into and out of the posture can be performed without allowing the hands to touch the floor.